The Arts Center is proud to announce their annual, first ever April Fool’s Day Jug Band Review and Vaudeville Circus to be held on April 1st, promptly at approximately 7:30PM. This highly entertaining ensemble performance is sponsored by The Village Idiot Society of Middle Tennessee and features Murfreesboro’s inimitable minstrels of musical mayhem, The Jake Leg Stompers. Expect heavy doses of Chicken-Fried, Pre-War, Hokum-Billy Jug Band music of the variety that makes you want to get up and shake your lederhosen! Performing on vintage instruments such as banjo-uke, fiddle, tuba, guitar, washboard and saw, the Stompers capture the rebellious spirit of pre-1941 American music from Memphis Jug bands to Appalachian Hillbilly to Fats Waller when folk music was still dangerous. 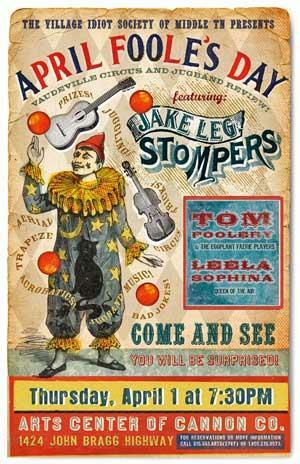 In keeping with the fine traditions of true Vaudeville Circus, the Stompers will be joined onstage by Cannon County’s own Tom Foolery and his Eggplant Faerie Players, who bring years of professional experience in the fine arts of juggling, unicycle, stilt-walking, and general hilarity. Rounding out the Vaudeville Circus will be the incomparable Leela Sophina, Queen of the Air, on her burlesque trapeze. The Jake Leg Stompers are part of the Coach Micheal Burt Concert Series. Ticket prices are $15 for adults, $12 for seniors, students and groups of ten or more. The Arts Center is located on 1424 John Bragg Highway, just west of the town of Woodbury, approximately 20 minutes from Murfreesboro, Manchester, and McMinnville and one hour southeast of Nashville. Office hours are 10:00a.m. to 4:00p.m., Monday through Saturday. For reservations or more information call 615-563-(ARTS) 2787 or 1-800-235-9073.